With the Irish Open set to unfold at Ballyliffin Golf Club on July 5 – 8, the golf world’s eyes are on northwest Ireland. While your initial inclination may be to play well-known courses such as Portmarnock, Royal County Down and Royal Portrush on an Irish golf vacation, there’s something to be said for embarking on an “off the beaten track” itinerary. Northwest Ireland is full of hidden gems offering all the splendor of big-name courses without the hassle. The unique beauty of these destinations lies not only in their remote locations, but in the ease with which you can book a tee time. Rather than hoping the stars align just right so you can play a selection of layouts in high demand, why not visit a region where you can visit many of the courses at your leisure? Named the world’s “Coolest Destination” for 2017 by National Geographic Traveller, County Donegal is just the spot. We’ve put together a list of our top five hidden gems in this exceptional region. Old Tom Morris looking over Rosapenna Hotel & Golf Resort. Occupying the alluring links land bordering idyllic Sheephaven Bay, the Old Tom Morris Links at Rosapenna requires every club in the bag to be hit throughout the round. Dating back to 1893, the layout features brilliant seaside golf that takes full advantage of its surroundings. 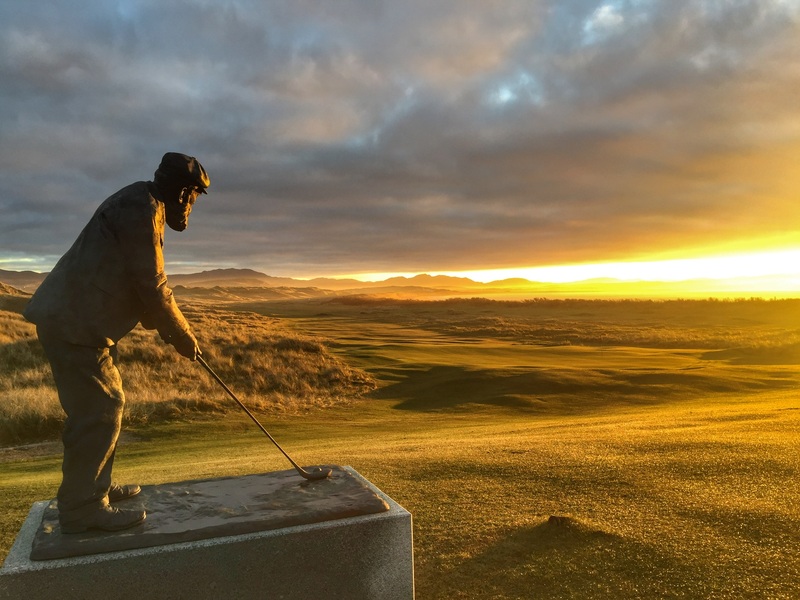 Its counterpart – the Sandy Hills Links at Rosapenna – opened in 2003 but feels as if it dates back to the Old Tom Morris days. Designed by golf-writer-turned-course-architect Pat Ruddy, most holes travel through corridors framed by hefty sand hills creating an atmosphere of peaceful tranquility from the outside world. Many feature elevated tee shots hit down to serpentine fairways that pinball your drive with reckless abandon. The par-4 420-yard 6th hole at the far end of the course is a treasure. The drive plays over a crest that offers a mesmerizing vista of the bay, bucolic farmland across the way, and imposing Muckish Mountain straight ahead in the distance. Donegal Golf Club or known to many as Murvagh. Located on the Murvagh peninsula in South Donegal, this Eddie Hackett design is often called “the Muirfield of Ireland.” It measures an immense 7,453 yards from the championship tees, making it one of the longest golf courses in Europe. Despite its intimidating length, Donegal is an easy – and delightfully scenic – walk. Occupying 182 acres on a quiet peninsula, the course is surrounded by the Atlantic Ocean, Donegal Bay and a designated Special Area of Conservation. The distinct design features two nine-hole loops – with one nestled inside the other – both affected by the constantly changing sea breeze. Donegal is an ideal track for those seeking natural tranquility and a respite from the outside world. The par-3 5th hole, aptly named the “Valley of Tears,” has no fairway making an accurate tee shot essential. Smackdab on the rugged, weather-beaten Atlantic coastline with dramatic views of the endless whitecaps of Gweebarra Bay, Narin & Portnoo Golf Club is a real treat. With an old-fashioned ambiance reminiscent of classic old Scottish gems like Brora Golf Club and Crail’s Balcomie Links, the course plays hard and fast through sand hill mesas and fiercely undulating turf. Run-up plays closer to the ground are a safer choice as the blustery sea winds wreak havoc on high shots. One of the world’s best 9-hole courses, Cruit Island is also one of the most scenic. It overlooks Arranmore and Owey Islands and is set against Mount Errigal, the tallest peak in County Donegal. Cruit (pronounced “crutch”) opened in 1986, but its wild and windswept aesthetic fits in with courses a century its senior. The par-3 150-yard 6th plays along the cliff edge making it as picturesque as it is challenging. Pay attention to the course’s many hidden bumps and dips so you’ll be better prepared on your second go-round. Host of this year’s Irish Open, Ballyliffin may not quite fit the bill of a “hidden gem,” but its Old Links layout has long been underrated. Ireland’s northernmost golf club, Ballyliffin boasts 36 exhilarating holes set on wonderfully violent terrain. To prepare for your round, scope out the ground’s bumps and ripples from the balcony near clubhouse’s second-story bar. Ballyliffin is links golf at its finest. Northwest Ireland is an ideal destination for those who have traveled to the southwest or Northern Ireland or who are simply looking for a relaxing golf getaway. Pair some – or all! – of the courses listed above with spectacular accommodations at Lough Eske Castle or Harvey’s Point for a truly special trip. To book a Northwest Ireland golf experience to include these off the beaten track course and more, contact our travel team today using the contact form below, or call +353 1 822 6662 or US Toll Free 1 855 617 5701.